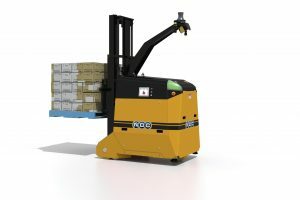 Leading material handling and logistics automation company Dematic announced that it has made its first delivery of the company’s new range of Automated Guided Vehicles (AGVs) from its factory in Belrose, NSW. The delivery was for a major Australian beverage company, which ordered four-metre double pallet handlers and six-metre double pallet handlers, all with fork spreading capabilities. Dematic’s new AGVs provide multiple benefits to customers, allowing for handling of double pallets of product which will be transported safely and accurately around the clock by driverless AGVs. These benefits include reduced labour costs and on-going damage to equipment and stock, as well as improved supply chain reliability and traceability. For businesses which run multiple shifts, the return on investment is rapid. “We began manufacturing Dematic’s new AGV range in our Sydney facility in June this year,” said Tommy Eklof, Director of AGVs at Dematic. Dematic’s comprehensive range of AGVs includes forklifts, unit load, very narrow aisle (VNA) and specialty vehicles to reliably move materials, stock and finished goods through DCs and production environments in a timely, safe and cost-effective manner. In March 2016, the company acquired NDC Automation, a leading provider of AGVs and software in Australia and New Zealand, adding further to its comprehensive range of integrated logistics and supply chain automation solutions. NDC has been the leading manufacturer and supplier of AGVs in Australia for over 25 years.